The GrandWay fixed blade knife FBX-2 AL will appeal to fans of military style, spy movies and tactical games. This is all metal quality knife of dagger type. The handle is a continuation of the blade reinforced with steel plates on both sides as well as aluminum covers of black color. The handle has notches and grooves which increase ergonomics, comfortable grip and ease of use. It is equipped with a hole for a lanyard or safety cord. The spear point blade is double edged and is made of corrosion resistant chromium steel of 440C grade. High steel properties make the blade resistant to stroke loads. The blade has partially serrated edge that allows you to keep the sharpness of the main cutting edge longer and apply less effort in efficient use of the knife. The sheath is made of a flexible, pleasant to the touch, rough plastic. The presence of a molded clip and two rows of holes along the perimeter indicate several options for wearing the FBX-2 AL knife on clothing or equipment. The dagger is easily fixed in the sheath as well as released from it. In general, this is a technological knife of urban tactical style, which is equally good for wearing in the EDC kit or survival set and for self-defense and other survival, scouting, camping and bushcrafting purposes. Such well-made knife could be the best gift for birthdays, man days, any date dedicated to friendship or occasion to make nice to your brother, co-worker, boys and guys. 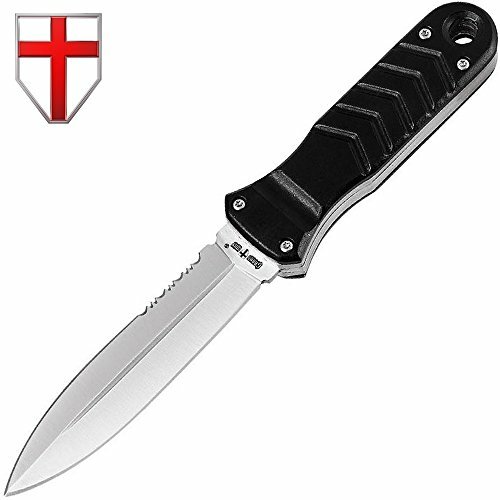 TACTICAL KNIFE HEAVY-DUTY COMBAT MILITARY DAGGER is made of one solid piece of metal with fixed spear point blade of a double edged design that is extremely functional and sharpened on both sides. MADE OF 440C STAINLESS STEEL - balanced composition of the steel ensures long-term operation without sharpening, good corrosion resistance to rust and high durability, it has high-quality factory sharpening. Could be the best knife in your military or tactical knife set. COMES WITH FREE SHEATH - this solid and practical holder allows you to wear the knife on your belt. The multifunctional sheath is made of heavy duty black molded plastic.